Avoid this by microchipping your pet! Take the steps here to help bring your beloved pet home to safety. If your pet is lost, don’t delay. Without proper identification, you might never find your pet if lost. Don't waste days or hours wishing your pet will come home. The sooner you begin your search,the better the odds of finding your pet. Search your neighborhood or the area where your pet was lost, and let area people know he's missing. Consider offering a reward. Call your pet’s name and check any places he could have become trapped, such as in garage, shed or under vehicles. A lost pet often will hide during the day, so be sure to go out again at night with a flashlight and call for him. Sometimes a can of food can lure a hungry and scared pet to you. Call in a “lost pet” report to your local animal shelter(s) and animal control immediately. Some larger cities, including the St. Cloud area have more than one shelter, so be sure to contact all of them in your area. Numbers are listed in the sidebar. Visit animal control and TCHS in person every day to search for your pet. Many animals are difficult to describeover the phone, and only you really know what your pet looks like. 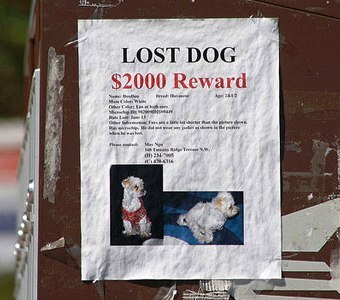 Make "lost pet" posters or flyers using your pet's photo. Put them up in your neighborhood and in post offices, libraries, pet supply stores, veterinary clinics and grocery stores. Inform area veterinarians and groomers that your pet is lost in case they receive a call. Advanced Care Pet Hospital maintains a log of lost and found pets. Place ads in local newspapers and on free internet classified sites such as www.craigslist.com. Offer a reward in case someone found your untagged pet and was thinking of keeping it. We frequently receive visits from people who keep the cats they have found. Watch the “found” ads in the newspaper and on the internet. Respond to any that are even close to your pet's description. What one person describes as a “tan shepherd mix” may look like a “yellow lab mix” to someone else. Call your local radio stations. Some radio stations will broadcast lost pet information for free. Give them very detailed information on where your pet was lost, his description and how to contact you. Please, for your pet’s sake, show you care by properly identifying it. Learn more about tagging and microchipping your pet. Have you ever seen a dog or cat running loose on a busy street and feared for its safety? You may have tried to get it out of harm’s way -- or you may have wanted to, but weren’t sure how. Capture and contain it with care. If you see a stray cat or dog, try to capture and contain the animal if circumstances permit. Always approach stray animals slowly and cautiously while speaking in a calm, gentle voice. You can also use food to coax a frightened animal into approaching you. Ideally, dogs should be secured using a leash or contained in a fenced yard. A belt or piece of ropecan be used as a slip lead in an emergency, but keep in mind that these items are not appropriate as a routine means of controlling a dog. Most cats do not like to be held for any length of time, so stray kitties are best confined inside a cat carrier, secure box (with air holes), small room of your house or temporarily in your car (as long as the car is well ventilated and not too hot). Never put yourself in harm’s way by attempting to capture an animal that is behaving aggressively. If you cannot safely approach the animal or if it runs away, call animal control or the local police department immediately.Give the dispatcher the exact street address where the animal was last seen. Once you have contained the lost pet, check to see if the animal is wearing an ID tag. If so, you may be able to immediately contact the owner and return the pet to her or him. If the pet is wearing ID, but you are unable to immediately make contact with the owner, you may choose to hold onto the pet for a few hours and wait for a call back from the owner. If you choose this course of action, it is still advisable to immediately file a “found” report with the St. Cloud animal shelter or TCHS in case the owner calls or goes there to search for the pet. Call either Animal Control or local police if the pet is to aggressive to transport yourself. If the pet is not wearing an ID tag, and non aggressive, you can take it to a shelter or have it scanned here at Advanced Care Pet Hospital. Most Vets will scan lost pets for microchips for free, we do. If the pet is aggressive, the best course of action is to either call the animal control or police department to pick it up for transport. There the staff will scan the animal for a microchip. If it is chipped, the staff will be able to find the owner’s contact information by accessing the online microchip database. Take pets with no ID to the animal shelter. If the animal has no ID tag or microchip, its best chance of being reunited with its owner is generally at an animal shelter. The shelter is the one obvious place where owners are likely to look for lost pets. While most shelters maintain a database of “found”reports, these reports are often inaccurate due to the subjectivity of the person describing the animal. Often people are not familiar with breeds and coat colors. They may not be able to give an accurate description of the animal they have found. The St. Cloud Animal Control website posts pictures of pets they have recovered. It may however, updated consistently. City of St. Cloud "Animals At Large"